The Hartridge Testmaster 3 HH701 is pneumatically operated, incorporating an LCD display and sophisticated menu driven software for analysing injector nozzle performance. The Testmaster 3 HH701 is compact in size, easy and flexible in use, and permits test results to be stored and recorded via an external PC/printer. Pressure reading display both digitally and an analogue bar graph on back-lit LCD display. Digital display enables better accuracy. In accordance with ISO 8984-1 and ISO 8984-2 standards. Menu driven software for ease of use. Injector test plan facility (up to 200 memory locations). Automatic pass/fail indication when the test plan facility is used. Easy access to injector test plans. 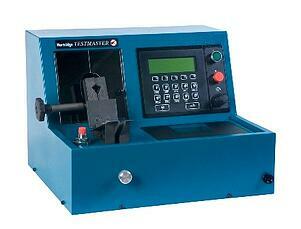 Traceability of injector test results. Offers outstanding value for money. Flow control to detect injector chatter.